Nav System, Heated Seats, Hitch, TRAILERING EQUIPMENT, CD Player, Onboard Communications System, 4x4, Back-Up Camera, SLE VALUE PACKAGE. DARK SLATE METALLIC exterior and JET BLACK interior, SLE trim. EPA 22 MPG Hwy/16 MPG City! CLICK NOW! 4x4, Back-Up Camera, CD Player, Onboard Communications System. Keyless Entry, Privacy Glass, Steering Wheel Controls, Electronic Stability Control, Heated Mirrors. SLE VALUE PACKAGE includes (AG1) driver 10-way power seat adjuster when ordered with (AZ3) seats only, (N37) manual tilt and telescopic steering column, (BTV) Remote vehicle starter system, (T3U) LED front fog lamps, (UG1) Universal Home Remote, (C49) rear-window defogger, (KI4) 110-volt AC power outlet, (CJ2) dual-zone climate control, (Z82) trailering equipment, and (G80) rear locking differential for 2WD models only, ENGINE, 5.3L ECOTEC3 V8, WITH ACTIVE FUEL MANAGEMENT, DIRECT INJECTION and Variable Valve Timing, includes aluminum block construction (355 hp [265 kW] @ 5600 rpm, 383 lb-ft of torque [518 Nm] @ 4100 rpm; more than 300 lb-ft of torque from 2000 to 5600 rpm), SUSPENSION PACKAGE, OFF-ROAD includes Z71 chrome side front fender emblems, monotube Rancho brand shocks and (K47) air cleaner, (JHD) Hill Descent Control, (NZZ) underbody shield (Includes (UHN) 18" x 8.5" (45.7 cm x 21.6 cm) bright machined aluminum wheels. AUDIO SYSTEM, 8" DIAGONAL COLOR TOUCH SCREEN NAVIGATION WITH GMC INFOTAINMENT SYSTEM, AM/FM/SIRIUSXM, HD RADIO with USB ports, auxiliary jack, Bluetooth streaming audio for music and most phones, Pandora Internet radio and voice-activated technology for radio and phone, TRAILERING EQUIPMENT includes trailer hitch, 7-pin and 4-pin connectors (Includes (G80) locking rear differential on 2WD models. Nav System, Heated Seats, Hitch, TRAILERING EQUIPMENT, CD Player, Onboard Communications System, 4x4, Back-Up Camera. FUEL EFFICIENT 22 MPG Hwy/16 MPG City! SLE trim, DARK SLATE METALLIC exterior and JET BLACK interior READ MORE! 4x4, Back-Up Camera, CD Player, Onboard Communications System Keyless Entry, Privacy Glass, Steering Wheel Controls, Electronic Stability Control, Heated Mirrors. NAV, Heated Seats, Tow Hitch, TRAILERING EQUIPMENT, CD Player, Onboard Communications System, 4x4, Back-Up Camera, DARK SLATE METALLIC. DARK SLATE METALLIC exterior and JET BLACK interior, SLE trim. EPA 22 MPG Hwy/16 MPG City! READ MORE! 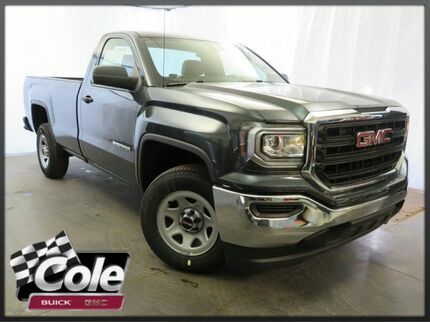 2018 GMC Sierra 1500 2WD Regular Cab 133.0"
FUEL EFFICIENT 24 MPG Hwy/18 MPG City! 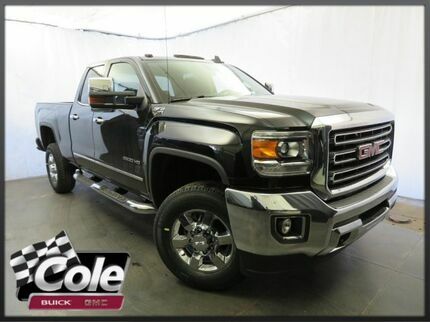 Sierra 1500 trim, DARK SLATE METALLIC exterior and JET BLACK / DARK ASH interior. DIFFERENTIAL, HEAVY-DUTY LOCKING REAR... AUDIO SYSTEM, 7" DIAGONAL COLOR TOUCH... Back-Up Camera. READ MORE! Back-Up Camera Electronic Stability Control, HID headlights, 4-Wheel ABS, 4-Wheel Disc Brakes, Tire Pressure Monitoring System. DIFFERENTIAL, HEAVY-DUTY LOCKING REAR, TRANSMISSION, 6-SPEED AUTOMATIC, ELECTRONICALLY CONTROLLED with overdrive and tow/haul mode. 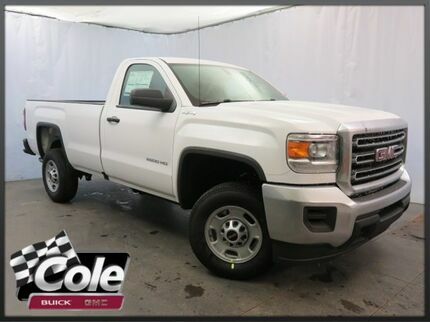 Includes Cruise Grade Braking and Powertrain Grade Braking (STD), ENGINE, 4.3L ECOTEC3 V6 WITH ACTIVE FUEL MANAGEMENT Direct Injection and Variable Valve Timing, includes aluminum block construction with FlexFuel capability, capable of running on unleaded or up to 85% ethanol (285 hp [212 kW] @ 5300 rpm, 305 lb-ft of torque [413 Nm] @ 3900 rpm) (Includes (FHS) E85 FlexFuel capability. (STD), AUDIO SYSTEM, 7" DIAGONAL COLOR TOUCH SCREEN WITH GMC INFOTAINMENT SYSTEM, AM/FM with USB ports, auxiliary jack, Bluetooth streaming audio for music and most phones, Pandora Internet radio and voice-activated technology for radio and phone (STD). 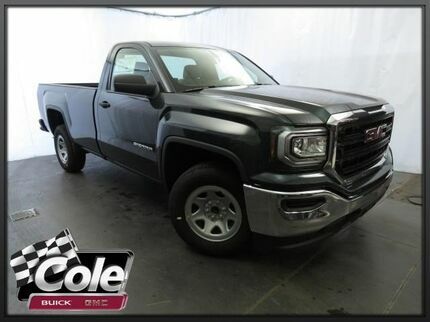 GMC Sierra 1500 with DARK SLATE METALLIC exterior and JET BLACK / DARK ASH interior features a V6 Cylinder Engine with 285 HP at 5300 RPM*. Edmunds.com's review says "Around town, the Sierra's brakes are friendly and capable. Like the brakes, the steering is easy and gives you enough confidence to pilot this truck around town.". Great Gas Mileage: 24 MPG Hwy. 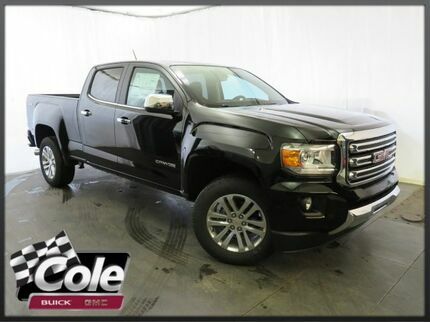 NAV, Heated Seats, Tow Hitch, CD Player, 4x4, Onboard Communications System, Back-Up Camera, ENGINE, 5.3L ECOTEC3 V8, WITH ACTIVE.. EPA 22 MPG Hwy/16 MPG City! SLE trim, SUMMIT WHITE exterior and JET BLACK interior. SEE MORE! 4x4, Back-Up Camera, CD Player, Onboard Communications System. Privacy Glass, Keyless Entry, Steering Wheel Controls, Electronic Stability Control, Heated Mirrors. Heated/Cooled Leather Seats, Navigation, Running Boards, Premium Sound System, Onboard Communications System, Back-Up Camera. 4WD Denali trim, ONYX BLACK exterior and JET BLACK interior. FUEL EFFICIENT 24 MPG Hwy/17 MPG City! CLICK ME! Leather Seats, 4x4, Heated Driver Seat, Cooled Driver Seat, Back-Up Camera, Running Boards, Premium Sound System, Onboard Communications System, Aluminum Wheels, Remote Engine Start, Heated Seats, Heated Leather Seats, Heated/Cooled Seats Keyless Entry, Steering Wheel Controls, Heated Mirrors, Electronic Stability Control, Bucket Seats. TRANSMISSION, 8-SPEED AUTOMATIC (STD), ENGINE, 3.6L DI DOHC V6 VVT (308 hp [230.0 kW] @ 6800 rpm, 275 lb-ft of torque [373 N-m] @ 4000 rpm) (STD), AUDIO SYSTEM, 8" DIAGONAL COLOR TOUCH SCREEN NAVIGATION WITH GMC INFOTAINMENT SYSTEM, AM/FM/SIRIUSXM with USB ports and auxiliary jack, Bluetooth streaming audio for music and most phones, hands-free smartphone integration, voice-activated technology for radio and phone; and "Shop" with the ability to browse, select and install apps to your vehicle. You can customize your content with audio, weather and more. (STD). GMC 4WD Denali with ONYX BLACK exterior and JET BLACK interior features a V6 Cylinder Engine with 308 HP at 6800 RPM*. Edmunds.com explains ". the Canyon's cabin comfort and features are far from basic. It's fundamentally refined, with very good noise isolation and effective climate control. The Canyon is easily up for long road trips an unusual trait in a midsize pickup.". Great Gas Mileage: 24 MPG Hwy. DARK SLATE METALLIC exterior and JET BLACK / DARK ASH interior, Sierra 1500 trim. EPA 24 MPG Hwy/18 MPG City! AUDIO SYSTEM, 7" DIAGONAL COLOR TOUCH... DIFFERENTIAL, HEAVY-DUTY LOCKING REAR... TRANSMISSION, 6-SPEED AUTOMATIC, ELEC... AND MORE! "Around town, the Sierra's brakes are friendly and capable. Like the brakes, the steering is easy and gives you enough confidence to pilot this truck around town." -Edmunds.com. Great Gas Mileage: 24 MPG Hwy. Navigation, Heated/Cooled Leather Seats, Running Boards, Premium Sound System, Onboard Communications System, 4x4. 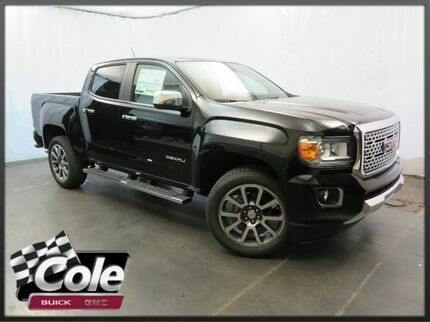 4WD Denali trim, DARK SLATE METALLIC exterior and JET BLACK interior. FUEL EFFICIENT 24 MPG Hwy/17 MPG City! CLICK ME! Leather Seats, 4x4, Heated Driver Seat, Cooled Driver Seat, Back-Up Camera, Running Boards, Premium Sound System, Onboard Communications System, Aluminum Wheels, Remote Engine Start, Heated Seats, Heated Leather Seats, Heated/Cooled Seats. Keyless Entry, Steering Wheel Controls, Heated Mirrors, Electronic Stability Control, Bucket Seats. TRANSMISSION, 8-SPEED AUTOMATIC (STD), ENGINE, 3.6L DI DOHC V6 VVT (308 hp [230.0 kW] @ 6800 rpm, 275 lb-ft of torque [373 N-m] @ 4000 rpm) (STD), AUDIO SYSTEM, 8" DIAGONAL COLOR TOUCH SCREEN NAVIGATION WITH GMC INFOTAINMENT SYSTEM, AM/FM/SIRIUSXM with USB ports and auxiliary jack, Bluetooth streaming audio for music and most phones, hands-free smartphone integration, voice-activated technology for radio and phone; and "Shop" with the ability to browse, select and install apps to your vehicle. You can customize your content with audio, weather and more. (STD). 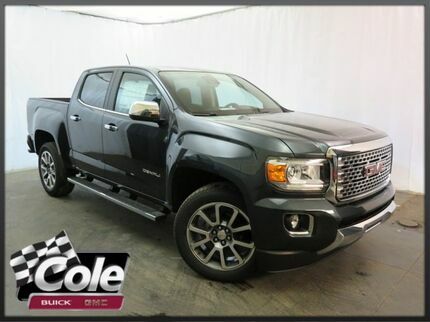 GMC 4WD Denali with DARK SLATE METALLIC exterior and JET BLACK interior features a V6 Cylinder Engine with 308 HP at 6800 RPM*. NAV, Heated/Cooled Leather Seats, Running Boards, Premium Sound System, Onboard Communications System, TRANSMISSION, 8-SPEED AUTOMATIC. SUMMIT WHITE exterior and JET BLACK interior, 4WD Denali trim. EPA 24 MPG Hwy/17 MPG City! CLICK NOW! TRANSMISSION, 8-SPEED AUTOMATIC (STD), ENGINE, 3.6L DI DOHC V6 VVT (308 hp [230.0 kW] @ 6800 rpm, 275 lb-ft of torque [373 N-m] @ 4000 rpm) (STD), AUDIO SYSTEM, 8" DIAGONAL COLOR TOUCH SCREEN NAVIGATION WITH GMC INFOTAINMENT SYSTEM, AM/FM/SIRIUSXM with USB ports and auxiliary jack, Bluetooth streaming audio for music and most phones, hands-free smartphone integration, voice-activated technology for radio and phone; and "Shop" with the ability to browse, select and install apps to your vehicle. You can customize your content with audio, weather and more. (STD). 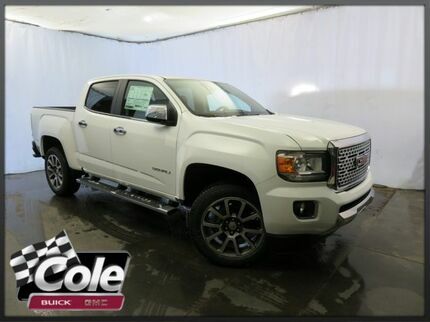 GMC 4WD Denali with SUMMIT WHITE exterior and JET BLACK interior features a V6 Cylinder Engine with 308 HP at 6800 RPM*. Edmunds.com's review says ". the Canyon's cabin comfort and features are far from basic. It's fundamentally refined, with very good noise isolation and effective climate control. The Canyon is easily up for long road trips an unusual trait in a midsize pickup.". Great Gas Mileage: 24 MPG Hwy. 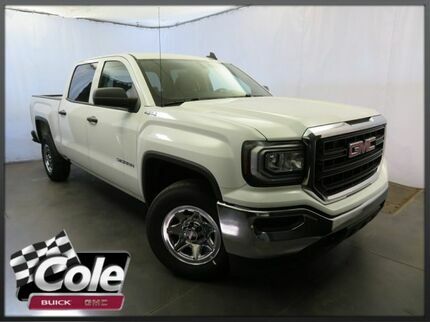 2018 GMC Sierra 2500HD 4WD Reg Cab 133.6"
SUMMIT WHITE exterior and JET BLACK / DARK ASH interior, Sierra 2500HD trim. 4x4, Back-Up Camera, TRANSMISSION, 6-SPEED AUTOMATIC, HEAV... AUDIO SYSTEM, 7" DIAGONAL COLOR TOUCH... ENGINE, VORTEC 6.0L VARIABLE VALVE TI... CLICK NOW! 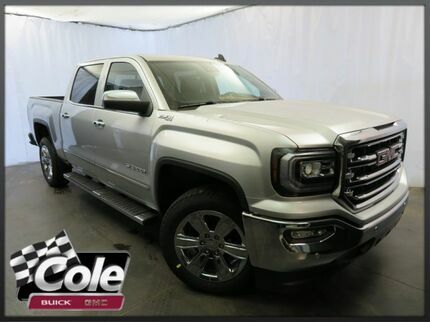 SIERRA CONVENIENCE PACKAGE includes (DL8) outside heated power-adjustable mirrors, (AQQ) Remote Keyless Entry, (A91) remote locking tailgate, (KI4) 110-volt AC power outlet, (UF2) LED cargo box lighting and (AKO) deep tinted glass; Regular Cab also includes (A31) power windows, TRAILERING EQUIPMENT Trailering hitch platform 2.5" with a 2.0" insert for HD, 7-wire harness with independent fused trailering circuits mated to a 7-way sealed connector to hook up parking lamps, backup lamps, right and left turn signals, an electric brake lead, battery and a ground, The trailer connector also includes the 4-way for use on trailers without brakes - park, brake/turn lamps Includes (JL1) trailer brake controller. AUDIO SYSTEM, 7" DIAGONAL COLOR TOUCH SCREEN WITH GMC INFOTAINMENT SYSTEM, AM/FM with USB ports, auxiliary jack, Bluetooth streaming audio for music and most phones, Pandora Internet radio and voice-activated technology for radio and phone (STD), ENGINE, VORTEC 6.0L VARIABLE VALVE TIMING V8 SFI, E85-COMPATIBLE, FLEXFUEL capable of running on unleaded or up to 85% ethanol (360 hp [268.4 kW] @ 5400 rpm, 380 lb-ft of torque [515.0 N-m] @ 4200 rpm (STD), TRANSMISSION, 6-SPEED AUTOMATIC, HEAVY-DUTY, ELECTRONICALLY CONTROLLED with overdrive and tow/haul mode. Includes Cruise Grade Braking and Powertrain Grade Braking (STD). Heated/Cooled Leather Seats, NAV, Back-Up Camera, Premium Sound System, Onboard Communications System, DENALI ULTIMATE PACKAGE. ONYX BLACK exterior and JET BLACK DENALI interior, Denali trim. FUEL EFFICIENT 20 MPG Hwy/15 MPG City! SEE MORE! Leather Seats, 4x4, Heated Driver Seat, Cooled Driver Seat, Back-Up Camera, Premium Sound System, Onboard Communications System, Trailer Hitch, Remote Engine Start, Dual Zone A/C, Heated Seats, Heated Leather Seats, Heated/Cooled Seats Privacy Glass, Keyless Entry, Steering Wheel Controls, Heated Mirrors, Electronic Stability Control. DENALI ULTIMATE PACKAGE includes (L86) 6.2L EcoTec3 V8 engine, (Q7M) 22" aluminum wheels with premium paint and chrome inserts, (CF5) power sunroof, (JL1) trailer brake controller, (BRS) Tri-Mode Power Steps, (VQY) chrome recovery hooks, LPO, AUDIO SYSTEM, 8" DIAGONAL COLOR TOUCH SCREEN NAVIGATION WITH GMC INFOTAINMENT SYSTEM, AM/FM/SIRIUSXM, HD RADIO with USB ports, auxiliary jack, Bluetooth streaming audio for music and most phones, Pandora Internet radio and voice-activated technology for radio and phone (STD), TRANSMISSION, 8-SPEED AUTOMATIC, ELECTRONICALLY CONTROLLED with overdrive and tow/haul mode. Includes Cruise Grade Braking and Powertrain Grade Braking (STD). 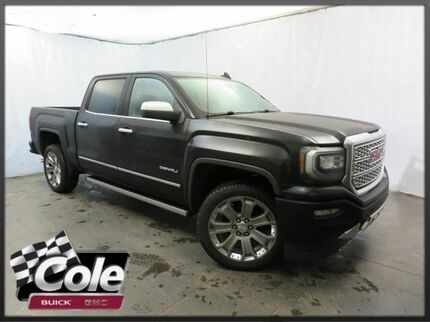 GMC Denali with ONYX BLACK exterior and JET BLACK DENALI interior features a 8 Cylinder Engine with 355 HP at 5600 RPM*. Edmunds.com's review says "Around town, the Sierra's brakes are friendly and capable. Like the brakes, the steering is easy and gives you enough confidence to pilot this truck around town.". Great Gas Mileage: 20 MPG Hwy. Navigation, Heated Leather Seats, Back-Up Camera, 4x4, Onboard Communications System, Aluminum Wheels. EPA 24 MPG Hwy/17 MPG City! RED QUARTZ TINTCOAT exterior and COCOA / DUNE LEATHER APPOINTED FRT SEATING interior, 4WD SLT trim CLICK NOW! Leather Seats, 4x4, Heated Driver Seat, Back-Up Camera, Onboard Communications System, Aluminum Wheels, Remote Engine Start, Heated Seats, Heated Leather Seats Keyless Entry, Steering Wheel Controls, Electronic Stability Control, Heated Mirrors, Bucket Seats. AUDIO SYSTEM FEATURE, BOSE PREMIUM 7-SPEAKER SYSTEM, AUDIO SYSTEM, 8" DIAGONAL COLOR TOUCH SCREEN NAVIGATION WITH GMC INFOTAINMENT SYSTEM, AM/FM/SIRIUSXM with USB ports and auxiliary jack, Bluetooth streaming audio for music and most phones, hands-free smartphone integration, voice-activated technology for radio and phone; and "Shop" with the ability to browse, select and install apps to your vehicle. You can customize your content with audio, weather and more. DRIVER ALERT PACKAGE includes (UEU) Forward Collision Alert, and (UFL) Lane Departure Warning, TRAILERING PACKAGE includes trailer hitch and 7-pin connector, TRANSMISSION, 8-SPEED AUTOMATIC (STD), ENGINE, 3.6L DI DOHC V6 VVT (308 hp [230.0 kW] @ 6800 rpm, 275 lb-ft of torque [373 N-m] @ 4000 rpm) (STD). 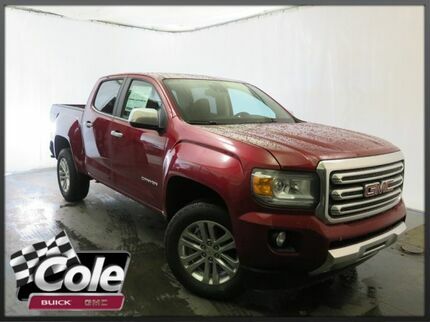 GMC 4WD SLT with RED QUARTZ TINTCOAT exterior and COCOA / DUNE LEATHER APPOINTED FRT SEATING interior features a V6 Cylinder Engine with 308 HP at 6800 RPM*. Edmunds.com's review says ". the Canyon's cabin comfort and features are far from basic. It's fundamentally refined Great Gas Mileage: 24 MPG Hwy. Navigation, Heated Leather Seats, Turbo Charged, 4x4, Onboard Communications System, Back-Up Camera. 4WD SLT trim, ONYX BLACK exterior and JET BLACK LEATHER APPOINTED FRT SEATING interior. FUEL EFFICIENT 28 MPG Hwy/20 MPG City! SEE MORE! Leather Seats, 4x4, Heated Driver Seat, Back-Up Camera, Onboard Communications System, Aluminum Wheels, Remote Engine Start, Heated Seats, Heated Leather Seats. Keyless Entry, Steering Wheel Controls, Electronic Stability Control, Heated Mirrors, Bucket Seats. ENGINE, 2.8L DURAMAX TURBO-DIESEL, DI, 4-CYLINDER (181 hp [135.0 kW] @ 3400 rpm, 369 lb-ft of torque [500 N-m] @ 2000 rpm), includes (K40) Exhaust brake, (JL1) Trailer brake controller, (NQ6) Transfer case (4WD models only), (S1K) 16" x 7" (40.6 cm x 17.8 cm) steel spare wheel and (ZJJ) P265/70R16 all-season, blackwall spare tire, AUDIO SYSTEM FEATURE, BOSE PREMIUM 7-SPEAKER SYSTEM, AUDIO SYSTEM, 8" DIAGONAL COLOR TOUCH SCREEN NAVIGATION WITH GMC INFOTAINMENT SYSTEM, AM/FM/SIRIUSXM with USB ports and auxiliary jack, Bluetooth streaming audio for music and most phones, hands-free smartphone integration, voice-activated technology for radio and phone; and "Shop" with the ability to browse, select and install apps to your vehicle. You can customize your content with audio, weather and more. DRIVER ALERT PACKAGE includes (UEU) Forward Collision Alert, and (UFL) Lane Departure Warning, TRAILERING PACKAGE includes trailer hitch and 7-pin connector, TRANSMISSION, 6-SPEED AUTOMATIC. 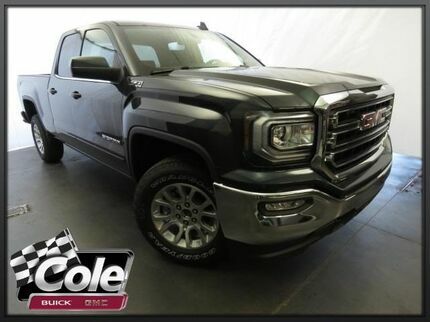 GMC 4WD SLT with ONYX BLACK exterior and JET BLACK LEATHER APPOINTED FRT SEATING interior features a 4 Cylinder Engine with 181 HP at 3400 RPM*. Heated Seats, NAV, 4x4, Onboard Communications System, CD Player, Back-Up Camera, Tow Hitch, SEATING, HEATED DRIVER AND FRONT PASS... SLE trim, ONYX BLACK exterior and JET BLACK interior. FUEL EFFICIENT 22 MPG Hwy/16 MPG City! READ MORE! 4x4, Back-Up Camera, CD Player, Onboard Communications System Keyless Entry, Privacy Glass, Steering Wheel Controls, Heated Mirrors, Electronic Stability Control. 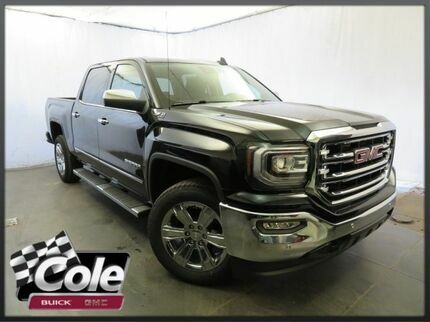 2018 GMC Sierra 1500 4WD Regular Cab 119.0"
Sierra 1500 trim, ONYX BLACK exterior and JET BLACK / DARK ASH interior. 4x4, Back-Up Camera, SIERRA CONVENIENCE PACKAGE, AUDIO SYSTEM, 7" DIAGONAL COLOR TOUCH... WINDOWS, POWER. FUEL EFFICIENT 22 MPG Hwy/16 MPG City! READ MORE! 4x4, Back-Up Camera Electronic Stability Control, HID headlights, 4-Wheel ABS, 4-Wheel Disc Brakes, Tire Pressure Monitoring System. ENGINE, 5.3L ECOTEC3 V8, WITH ACTIVE FUEL MANAGEMENT, DIRECT INJECTION and Variable Valve Timing, includes aluminum block construction (355 hp [265 kW] @ 5600 rpm, 383 lb-ft of torque [518 Nm] @ 4100 rpm; more than 300 lb-ft of torque from 2000 to 5600 rpm), SIERRA CONVENIENCE PACKAGE includes (DL8) outside heated power-adjustable mirrors, (AQQ) Remote Keyless Entry, (KI4) 110-volt AC power outlet, (A91) remote locking tailgate and (UF2) LED cargo box lighting; For Regular Cab also includes (A31) power windows, SIERRA APPEARANCE PACKAGE includes (RD7) 17" x 8" (43.2 cm x 20.3 cm) stainless steel clad wheels, (AKO) deep-tinted glass. DIFFERENTIAL, HEAVY-DUTY LOCKING REAR, WINDOWS, POWER with driver express up and down and express down on all other windows, AUDIO SYSTEM, 7" DIAGONAL COLOR TOUCH SCREEN WITH GMC INFOTAINMENT SYSTEM, AM/FM with USB ports, auxiliary jack, Bluetooth streaming audio for music and most phones, Pandora Internet radio and voice-activated technology for radio and phone (STD), TRANSMISSION, 6-SPEED AUTOMATIC, ELECTRONICALLY CONTROLLED with overdrive and tow/haul mode. Includes Cruise Grade Braking and Powertrain Grade Braking (STD). 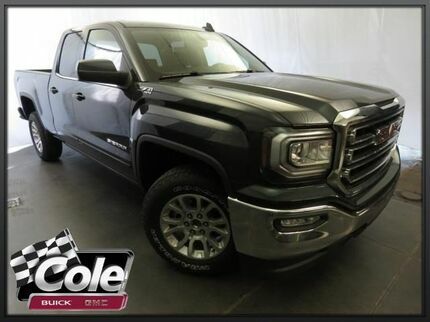 GMC Sierra 1500 with ONYX BLACK exterior and JET BLACK / DARK ASH interior features a 8 Cylinder Engine with 285 HP at 5300 RPM*. Heated Leather Seats, NAV, Back-Up Camera, 4x4, Tow Hitch, CD Player, SEATS, FRONT FULL-FEATURE LEATHER-APP... Remote Engine Start. SLT trim, ONYX BLACK exterior and JET BLACK interior. FUEL EFFICIENT 20 MPG Hwy/15 MPG City! READ MORE! 4x4, Back-Up Camera, CD Player, Onboard Communications System, Trailer Hitch, Remote Engine Start, Dual Zone A/C Keyless Entry, Privacy Glass, Electronic Stability Control, Heated Mirrors, Alarm. Nav System, Heated Leather Seats, 4x4, Back-Up Camera, Remote Engine Start, Onboard Communications System. EPA 24 MPG Hwy/17 MPG City! RED QUARTZ TINTCOAT exterior and JET BLACK LEATHER APPOINTED FRT SEATING interior, 4WD SLT trim CLICK ME! LPO, ASSIST STEPS, BLACK, 5" RECTANGULAR, AUDIO SYSTEM FEATURE, BOSE PREMIUM 7-SPEAKER SYSTEM, AUDIO SYSTEM, 8" DIAGONAL COLOR TOUCH SCREEN NAVIGATION WITH GMC INFOTAINMENT SYSTEM, AM/FM/SIRIUSXM with USB ports and auxiliary jack, Bluetooth streaming audio for music and most phones, hands-free smartphone integration, voice-activated technology for radio and phone; and "Shop" with the ability to browse, select and install apps to your vehicle. You can customize your content with audio, weather and more. DRIVER ALERT PACKAGE includes (UEU) Forward Collision Alert, and (UFL) Lane Departure Warning, TRAILERING PACKAGE includes trailer hitch and 7-pin connector, TRANSMISSION, 8-SPEED AUTOMATIC (STD), ENGINE, 3.6L DI DOHC V6 VVT (308 hp [230.0 kW] @ 6800 rpm, 275 lb-ft of torque [373 N-m] @ 4000 rpm) (STD). 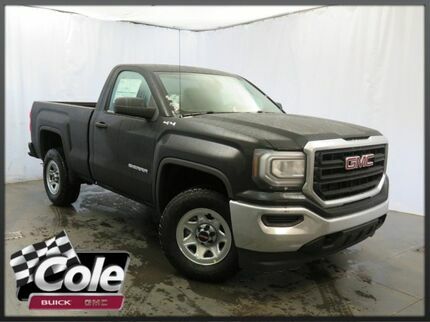 GMC 4WD SLT with RED QUARTZ TINTCOAT exterior and JET BLACK LEATHER APPOINTED FRT SEATING interior features a V6 Cylinder Engine with 308 HP at 6800 RPM*. ". the Canyon's cabin comfort and features are far from basic. It's fundamentally refined Great Gas Mileage: 24 MPG Hwy. 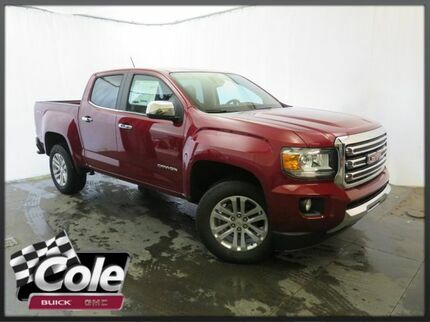 Heated Leather Seats, Navigation, 4x4, Chrome Wheels, Bed Liner, Back-Up Camera, SEATS, FRONT FULL-FEATURE LEATHER-APP... BED LINER, SPRAY-ON, CD Player, Trailer Hitch. ONYX BLACK exterior and JET BLACK interior, SLT trim CLICK ME! 4x4, Back-Up Camera, CD Player, Onboard Communications System, Chrome Wheels, Remote Engine Start, Dual Zone A/C Keyless Entry, Privacy Glass, Steering Wheel Controls, Electronic Stability Control, Alarm. Heated Leather Seats, Nav System, CD Player, Onboard Communications System, 4x4, Back-Up Camera, Remote Engine Start. SLT trim, QUICKSILVER METALLIC exterior and JET BLACK interior. FUEL EFFICIENT 20 MPG Hwy/15 MPG City! READ MORE! 4x4, Back-Up Camera, CD Player, Onboard Communications System, Trailer Hitch, Remote Engine Start, Dual Zone A/C. Keyless Entry, Privacy Glass, Electronic Stability Control, Heated Mirrors, Alarm. 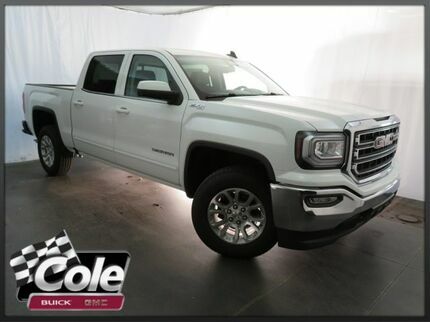 2017 GMC Sierra 1500 4WD Crew Cab 143.5"
Sierra 1500 trim, SUMMIT WHITE exterior and JET BLACK / DARK ASH interior. FUEL EFFICIENT 22 MPG Hwy/16 MPG City! Tow Hitch, 4x4, TRAILERING EQUIPMENT, AUDIO SYSTEM, 7" DIAGONAL COLOR TOUCH... SIERRA CONVENIENCE PACKAGE CLICK ME! 4x4 Electronic Stability Control, HID headlights, 4-Wheel ABS, 4-Wheel Disc Brakes, Tire Pressure Monitoring System. ENGINE, 5.3L ECOTEC3 V8, WITH ACTIVE FUEL MANAGEMENT, DIRECT INJECTION and Variable Valve Timing, includes aluminum block construction (355 hp [265 kW] @ 5600 rpm, 383 lb-ft of torque [518 Nm] @ 4100 rpm; more than 300 lb-ft of torque from 2000 to 5600 rpm), SIERRA CONVENIENCE PACKAGE includes (DL8) outside heated power-adjustable mirrors, (AQQ) Remote Keyless Entry, (UVC) Rear Vision Camera, (KI4) 110-volt AC power outlet, (A91) remote locking tailgate and (UF2) LED cargo box lighting; For Regular Cab also includes (A31) power windows, TRAILERING EQUIPMENT includes trailer hitch, 7-pin and 4-pin connectors (Includes (G80) locking rear differential. ), SIERRA APPEARANCE PACKAGE includes (RD7) 17" x 8" (43.2 cm x 20.3 cm) stainless steel clad wheels, (AKO) deep-tinted glass, AUDIO SYSTEM, 7" DIAGONAL COLOR TOUCH SCREEN WITH INTELLILINK, AM/FM with USB ports, auxiliary jack, Bluetooth streaming audio for music and most phones, Pandora Internet radio and voice-activated technology for radio and phone (Includes (UQ3) 6-speaker audio system, (UE1) OnStar, (VV4) OnStar 4G LTE Wi-Fi Hotspot. TRANSMISSION, 6-SPEED AUTOMATIC, ELECTRONICALLY CONTROLLED with overdrive and tow/haul mode. Includes Cruise Grade Braking and Powertrain Grade Braking (STD). Edmunds.com explains "A versatile bed Great Gas Mileage: 22 MPG Hwy.